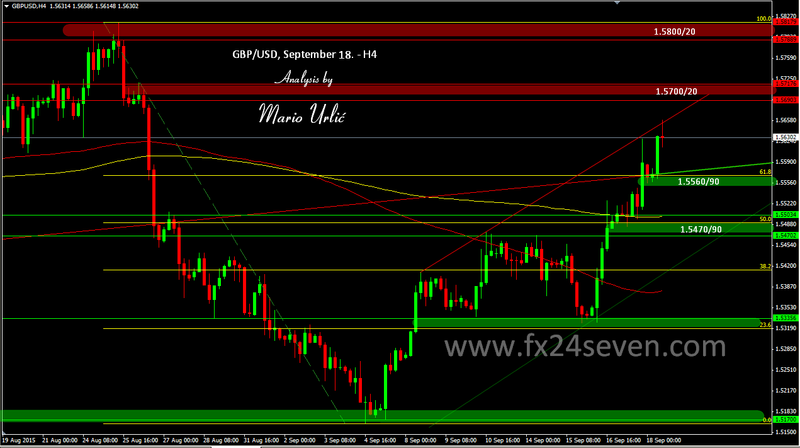 GBP/USD, climb back over the 'fibo stairs'. In my last GBP/USD analysis from September 02. I pointed at fist line of defence and possible target for the bears at 1.5160/80 and the pair reached exact that level at September 07., 1.5164 low. After 9 days fall in a row, the Pound finaly find the buyers there and the buyers were serious. Here we are, the second weekly growth in a row and the pair clibm back over the fibo levels all the way to 1.5658 high today. I find a reason why the pair stoped at this level for a while, just in front of the resistance level at 1.5700, but still looks bullish enough at least to hold this level today. This level was also a huge weekly resistance from July/August. On the way back, 15600, 15560 is first support and it should hold if the sellers took over the pair. Interesting 4 weeks at this pair for sure.